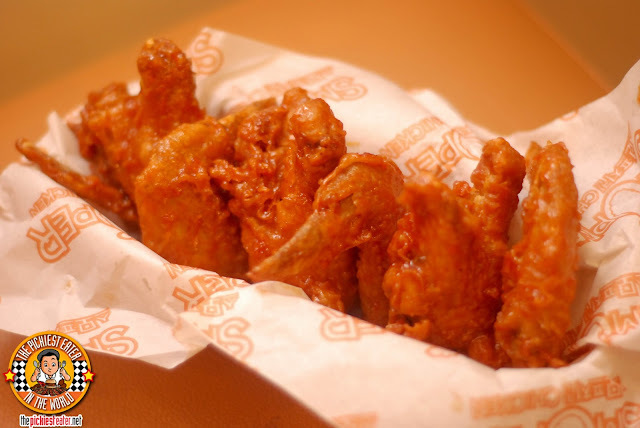 I still remember when Rina and I first got bitten by the Korean Chicken craze. The lines for the popular twice fried wings were ridiculously long, yet we braved it. And funnily enough, we continued to do so, until we eventually got sick of it. Truthfully, when all was said and done, 90% of the goodness came from the crispiness of the skin. 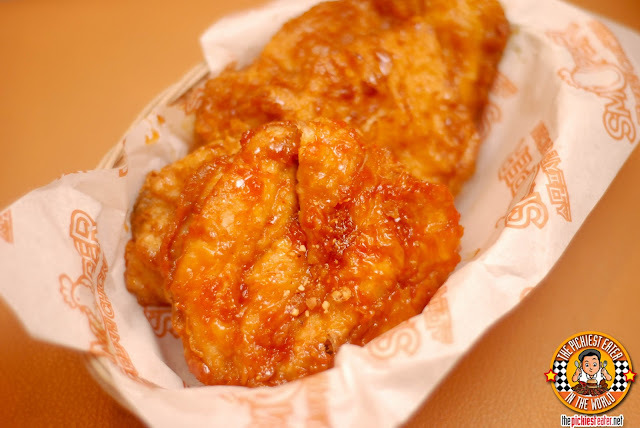 I found the meat itself lacking in flavor, which is why I stuck to the wings and stayed away from other cuts, such as the drumsticks, chops, or even my beloved thigh. Though my taste buds enjoyed the skin of the Soy Garlic, I couldn't help but think that the chicken meat itself could use some sort of a diping sauce. 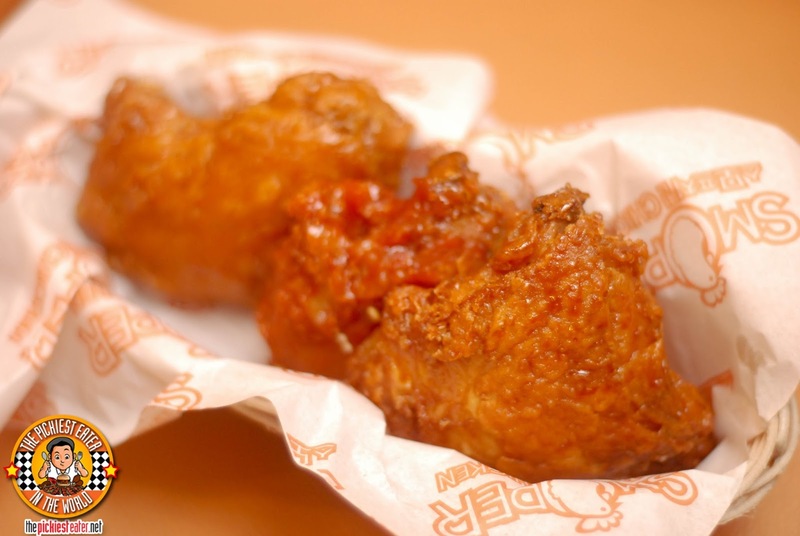 Years later (Possibly due to a chicken overload), my love for Korean Twice Fried Chicken has tempered. I don't look for it the way I used to. Nestled in a cozy spot at the ground floor of One McKinley Place, Smoper Chicken is a huge player in the Korean Fried Chicken game in Korea, with roughly around 800 stores scattered nationwide. 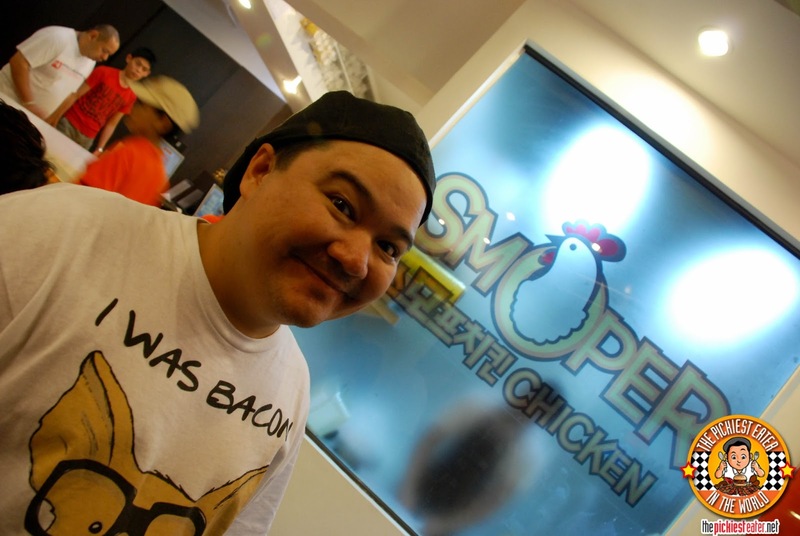 With one outlet already at Bonifacio Global City, Smoper Chicken is set to open another one at the Katipunan area very soon. 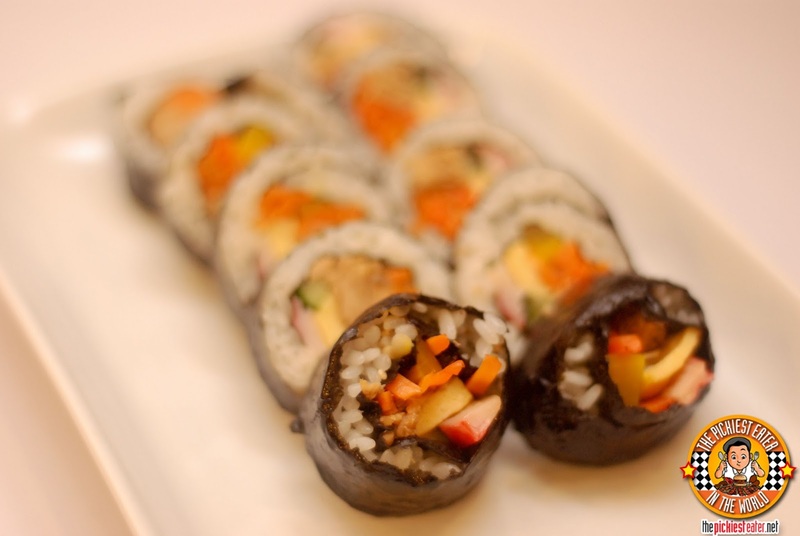 Smoper Chicken has what I feel is a Korean version of a California Maki Kimbap (P85). Inside the rolled seaweed, was kani, pickels, carrots, Cucumber and tuna. I don't eat anything with seaweed so I didn't bother trying this. 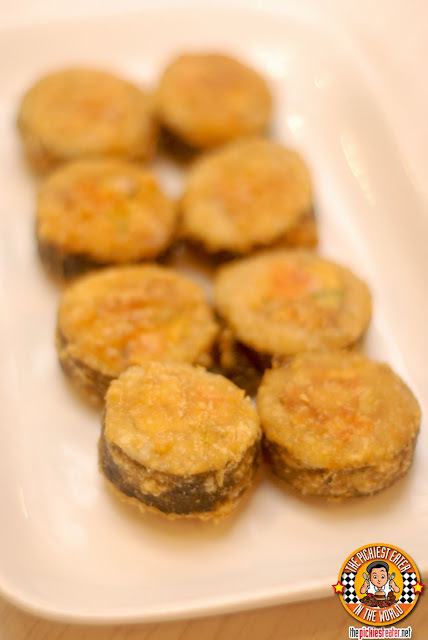 They also have a Fried Kimbap (P85) version, which they coated in a light batter and deep fried for an added crunch. I don't know if it added anything to the flavor. The Chicken Popcorn (P125) wasn't anything really special flavor-wise, but I did find something rather addicting to it. 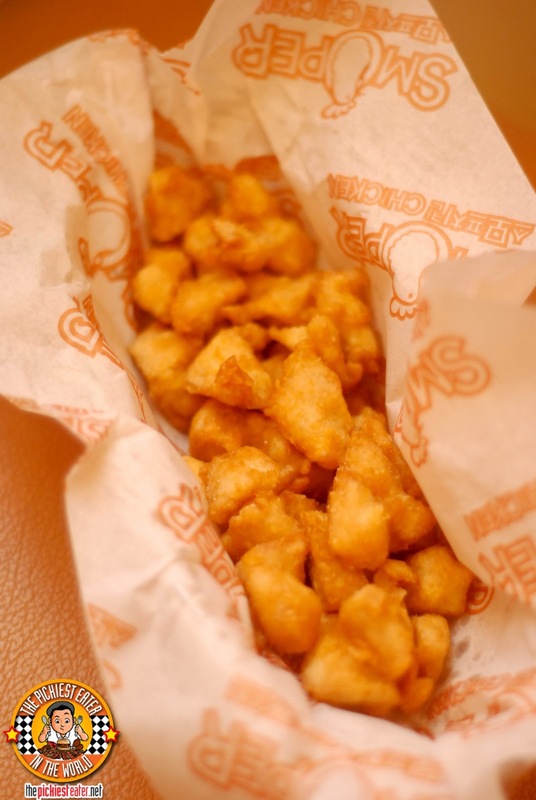 Bits of Chicken chunks dipped into a milky batter, then deep fried to a golden hue. 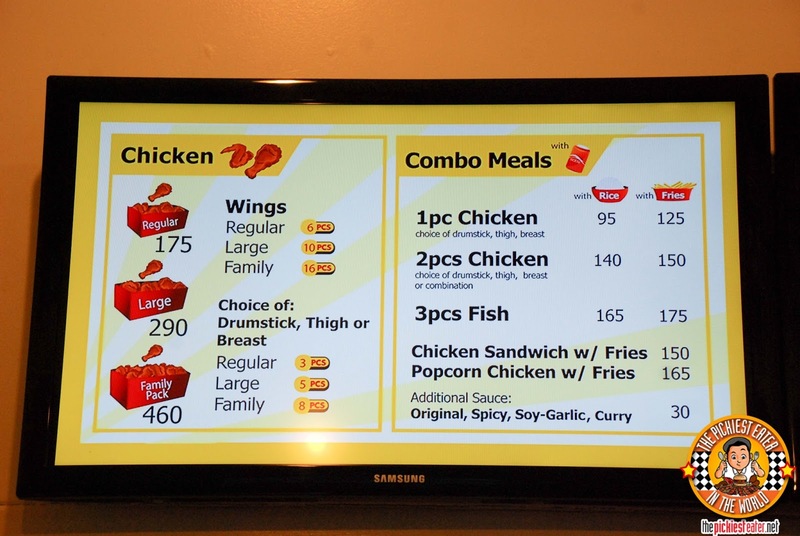 If you order this, I strongly suggest you order one of their extra sauces (I'll elaborate more about that later). Something I really enjoyed from Smoper Chicken was their Fish Sticks (4 pcs, P165). 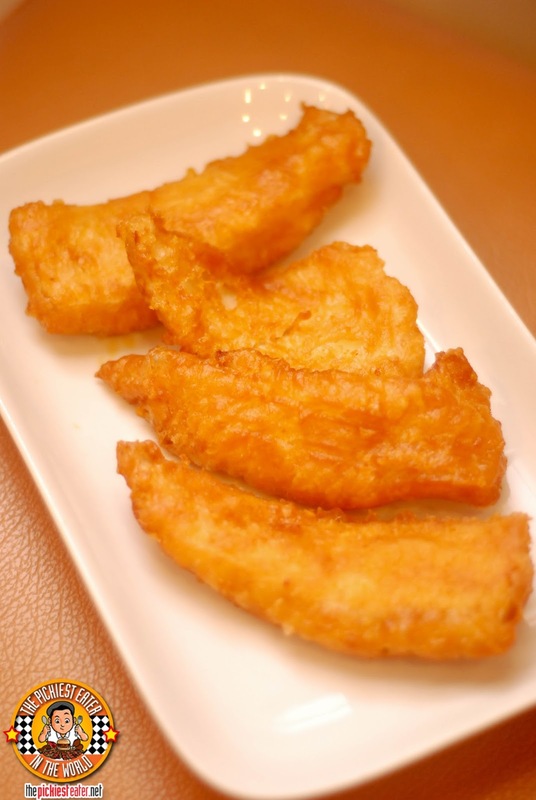 I really enjoy white fish, which had just the right amount of breading to keep it light, yet giving it a crispy exterior. If you're looking for a heavier meal, you could order Smoper's Bulgogi (Beef or Chicken, P150). Visually, it seemed dry and pale, but actually tasted a lot better than it looked. 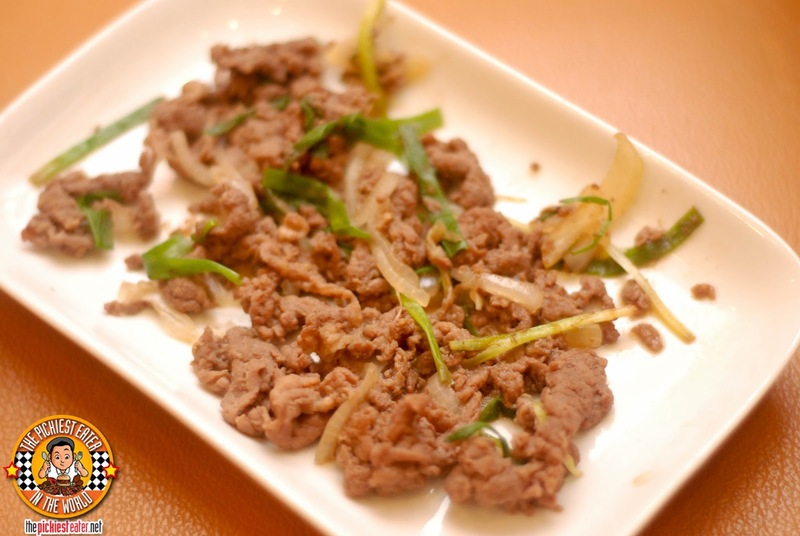 The decent flavor on the beef, which was accentuated by the sauteed onions and spring onions. 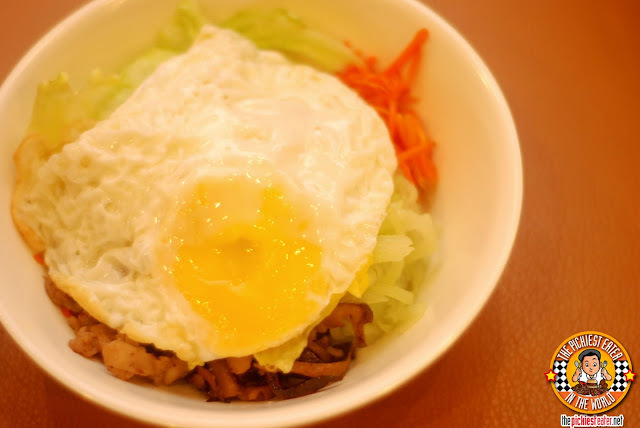 Another new dish they let us try was the Curry Rice bowl. 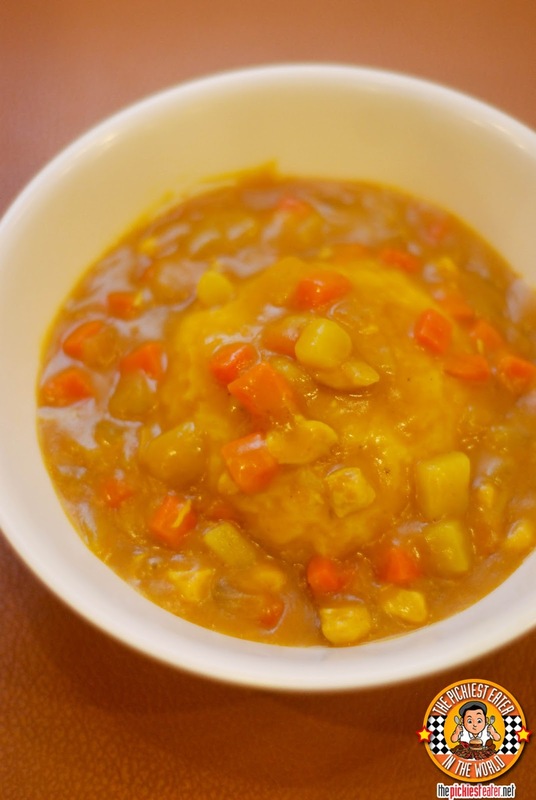 Though the sauce was a little bit gloopy, it had a nice touch of sweetness and fragrance to it, with diced carrots, potato and chicken added to the mix. I think a bit more chicken is needed to make this a heartier meal, but the necessary flavor components were there nonetheless. 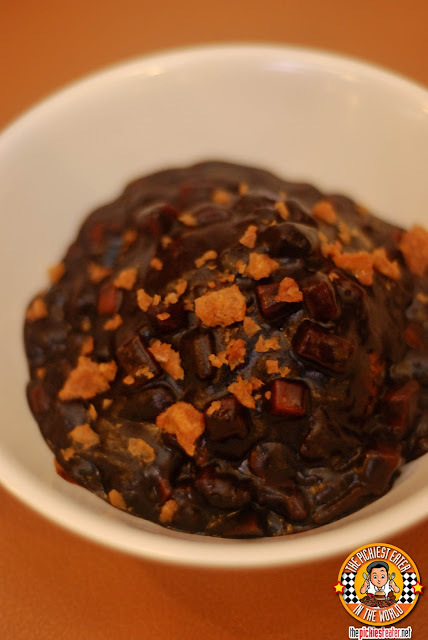 I honestly had no idea what to make of their "Jajang Yang", which was basically a scoop of rice, covered in a thick, black, almost gelatinous sauce, with bits of minced chicken. It was honestly a little strange for me, with saltiness of the black beans being the prominent flavor of the dish. Something that immediately caught my attention about Smoper, was the ability to choose from different sauces, instead of just the usual two from it's main competition. 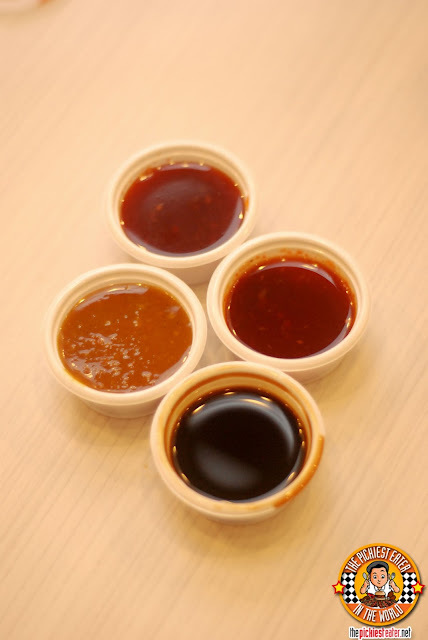 Apart from the usual Soy Garlic and Spicy, you may also choose from their "Original" blend, and curry. 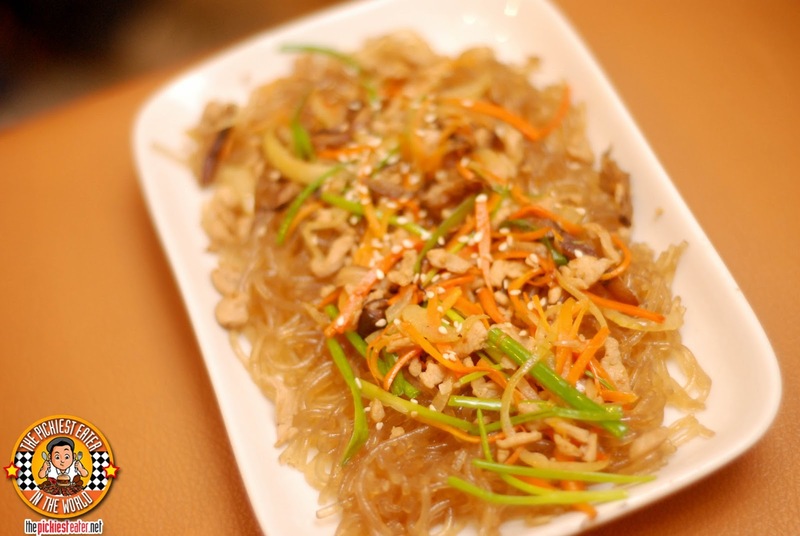 Also available, but I was unable to taste, was the Tukgangjung Sauce, which is a blend of sweet and spicy. Among all four sauces that I tried, my favorite was the curry, which had a wonderful blend of sweetness and fragrance at the same time, that went perfectly with the chicken. After that, it was a toss up between the Soy Garlic and Original (I admittedly couldn't distinguish one from the other), followed by the spicy (as usual). Another nice thing about Smoper is how they give you a selection of chicken cuts to choose from, glazed in the sauce of your choice. 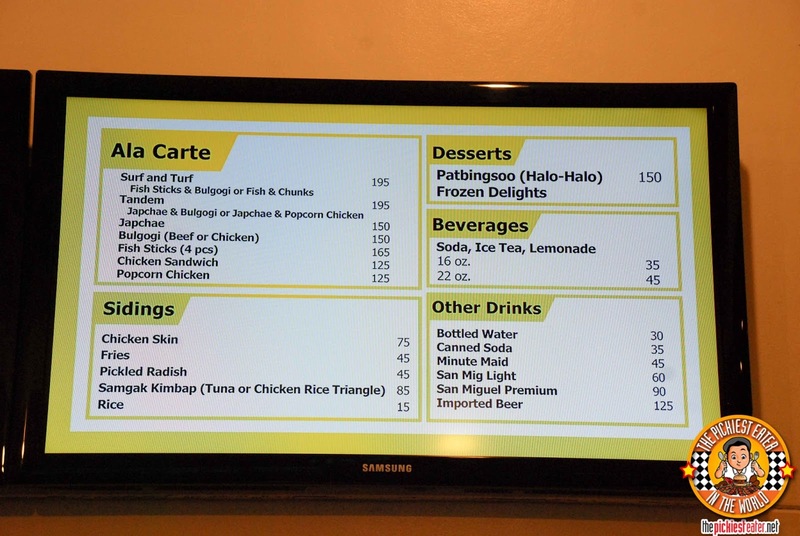 Yey for fries option! 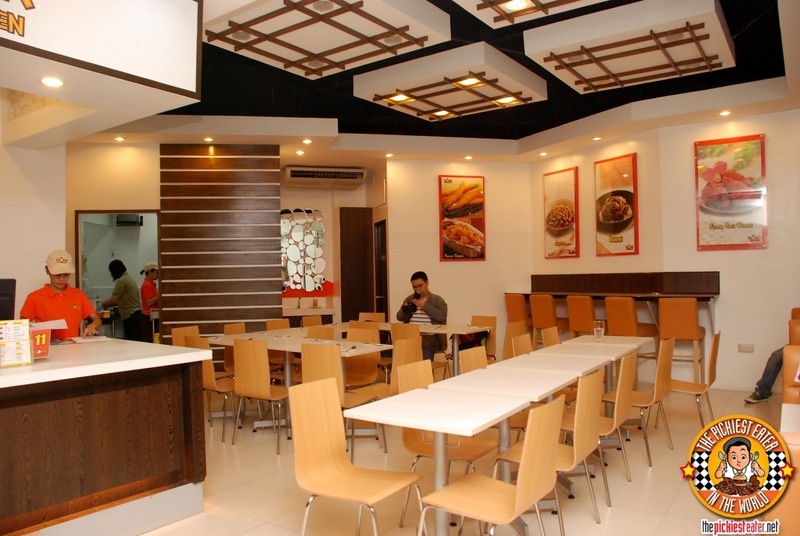 :) Hope they'll open a branch somewhere near me..hehe. Their chicken looks so delicious. I hope Smoper Chicken will have their branch here in Cebu City. if all goes well in manila, im pretty sure cebu will follow! hope you don't mind, i posted a link to your blog in my blog. please visit my blog at http://foodiehealthy.wordpress.com/ and its facebook page https://www.facebook.com/FOOD4LYF thanks!